The bio-energy released by the hydrolysis of adenosine triphosphate, which relate to plenty of life activities and is transported in a solution, and its theory of transport are first stated and built in helix protein molecule. ATPases is known to be a crucial in many biological activities of organisms. In this study, physicochemical properties and modeling of ATPases protein of fish was analysed using in silico approach. Proteomics is a rapidly growing field of molecular biology that is concerned with the methodical approach to protein expression analysis of a cell or an organism. 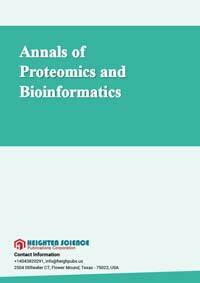 Annals of Proteomics and Bioinformatics endeavors publishing research updates on high-throughput proteomics technologies combined with advanced bioinformatics. The scope of publications in Heighpubs Proteomics and Bioinformatics research is to establish proteomics as a foundation for constructing and extracting useful knowledge to biomedical research. Since proteomics is growing at a very rapid pace, there is need of shift in the field from a specialized way of conducting studies towards a more global perspective.